Salads, Burgers, and Fries, Oh my! Roadside Style diner in the Heart of Manhattan. I’m looking for an affordable restaurant that has great quality burgers, fries, salads, and such. Any suggestions? Every once in a while I try a restaurant that I am so enthusiastic about, I feel it is my obligation to share it with you. So here’s the deal: Schnipper’s Quality Kitchen is my new favorite lunch or dinner place located in the New York Times building in NYC. This sleek, modern burger spot, owned by the Schnipper brothers of Hale & Hearty fame, is reminiscent of a roadside style diner right in the heart of midtown Manhattan. The cool open space is totally inviting and the food is to die for. Schnipper’s offers a great variety, there is something for everyone (go ahead, bring the kids). I loved my chopped market salad loaded with everything from avocado and beets, to corn and grilled chicken. Other standouts are the fish tacos, the light and flaky onion rings, fries (regular and sweet potato, mind you) and extraordinary burgers, possibly the best burger I ever tasted. Schnipper’s secret? They source out the freshest ingredients. The ice-cream is from Gifford’s in Maine (I am still dreaming about my chocolate peanut butter shake), the meat is from the same purveyor who provides to Peter Luger, the cheddar is from Vermont…you get the point. I can’t wait to go back on a spring day and take advantage of their great outdoor space. It’s a convenient spot for after work or after theater. 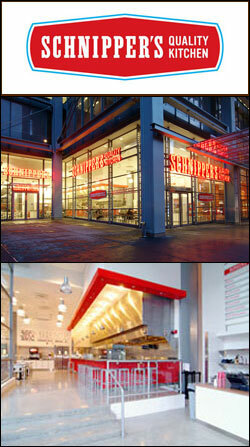 Schnippers offers online ordering, take-out, and delivery.